A version of this post appeared in the August 12th edition of UrbanToronto. Another adaptive reuse project has won out in Downtown Toronto. 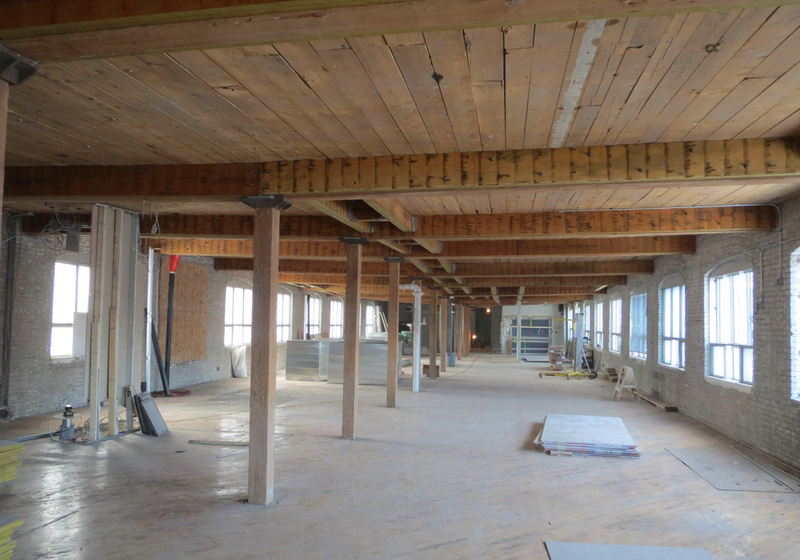 The modest building at 545 King Street West is being rehabilitated by Hullmark and will see new restaurants and offices occupy its five floors. It is a refreshing change from the tactics of some developers who, keen to maximize real estate values, can succumb to demolishing the historic fabric of the neighbourhood rather than considering the role adaptive reuse can play in the city. The street has radically transformed in the past decade. 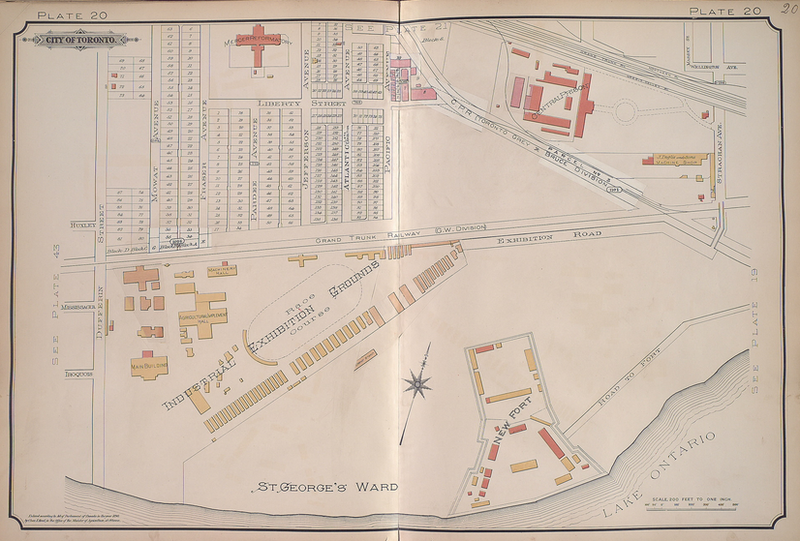 Its potential was unleashed back in the mid-90s when changes to zoning allowed King-Spadina (one of the “Two Kings” reinvestment areas), once-restricted to industrial, to open up to new uses. Since then, King Street W has been flooded with award-winning restaurants, corporate headquarters, nightclubs and condo buildings. The spin-off effect since the planning policy was introduced has seen this creatively oriented and vibrant part of the city emerge as a highly desirable urban lifestyle community. Originally built in 1921, with a rear addition completed in 1981, 545 King Street W is characterized by brick and heavy timber beam construction, once commonly found in the former Garment District. No drastic changes were made to the exterior in the Quadrangle Architects-led renovation. It is constituted of an updated façade treatment with new windows and sills, cleaned and repaired brickwork and the addition of graphics and material accents. Because of the building’s narrow proportions and the existence of windows on its side elevations, the designers were inspired to build on the idea of natural ventilation. Casements replace existing glazing, with coloured fritted glass emphasizing their operable function and animating the façades. “Our intention was a subtle augmentation of the building while maintaining the existing character to add a new layer of contemporary expression,” says Richard Witt, a principal at Quadrangle. The interiors, however, are getting a major facelift. The building was stripped back to its exterior walls and bare floors and ceilings, which presented the architects with the opportunity to completely reinvent its spaces. Popular restaurants Pizzeria Libretto and Porchetta & Co. will open up secondary locations on the lower level, and a software company is to set up shop on the 5th. BrightLane, a co-working space for entrepreneurs and start-ups, will continue to occupy the remaining levels and its members have access to the 3rd floor roof terrace. 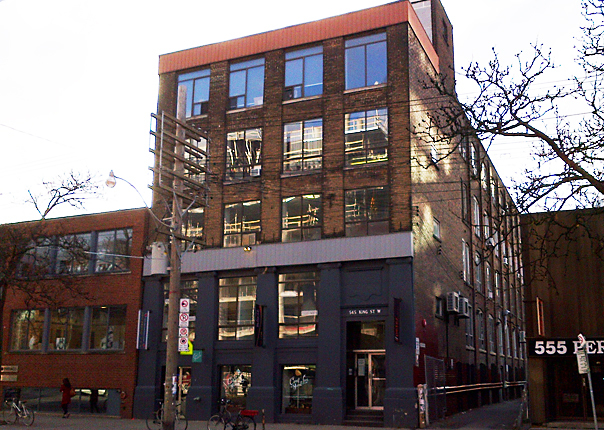 The top floor has a 2-storey volume office space capped with a skylight. A particularly interesting angle to the project is the revitalization of the dreary 153’ long by 12’ wide laneway immediately adjacent. It previously served a warehouse loading dock at the rear that the architects have transformed into the main commercial entrance and new ‘front door’. (The building’s existing ‘front door’ on King Street W becomes a convenience entrance for the upper levels.) 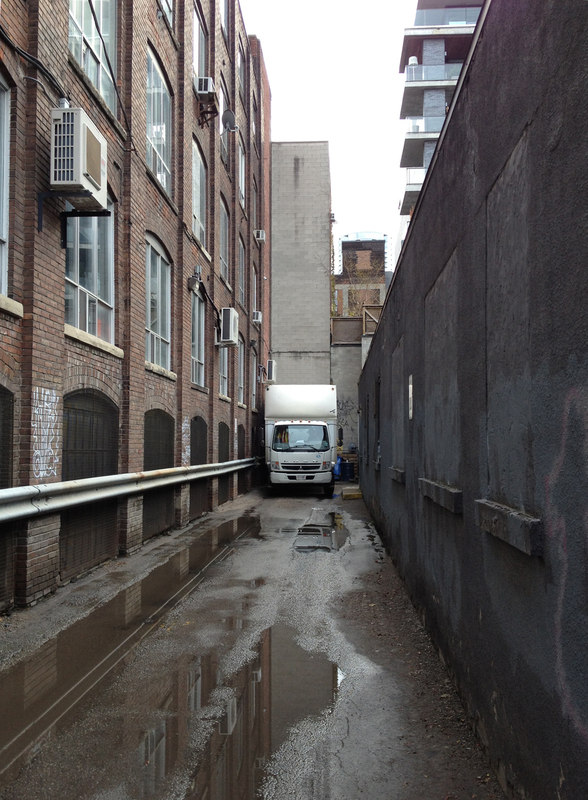 The flanking laneway, once dedicated to deliveries, is converted to a pedestrian area with a restaurant patio and spill-out space from the new lobby. BrightLane, the building’s primary tenant, hosted an ideas competition seeking inspiration from the public for ways to make the narrow, marginal space more appealing. “We’re looking for something interesting and sustainable that can be easily implemented,” said its General Manager, Susy Renzi. The call for submissions was made via video headlined ‘Can you make this sad space AWESOME?’ It drew over 180 entries from local and international creatives, whose ideas ran the gamut from forest oasis, outdoor market, and playgrounds for adults (with and without a giant waterslide). 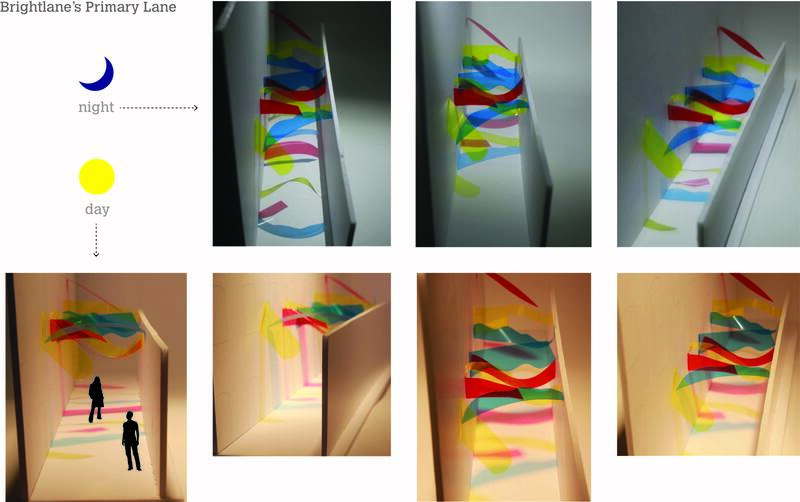 The winning scheme proposes to brighten the space by suspending fragments of primary-coloured acrylic in wavy shapes above it. As the sun travels over the lane, coloured moving shadows are cast onto surrounding surfaces; the experience being equally evocative at nighttime, when illuminated by floodlights. The canopy of colour represents the energy and interdisciplinary environment that BrightLane fosters. 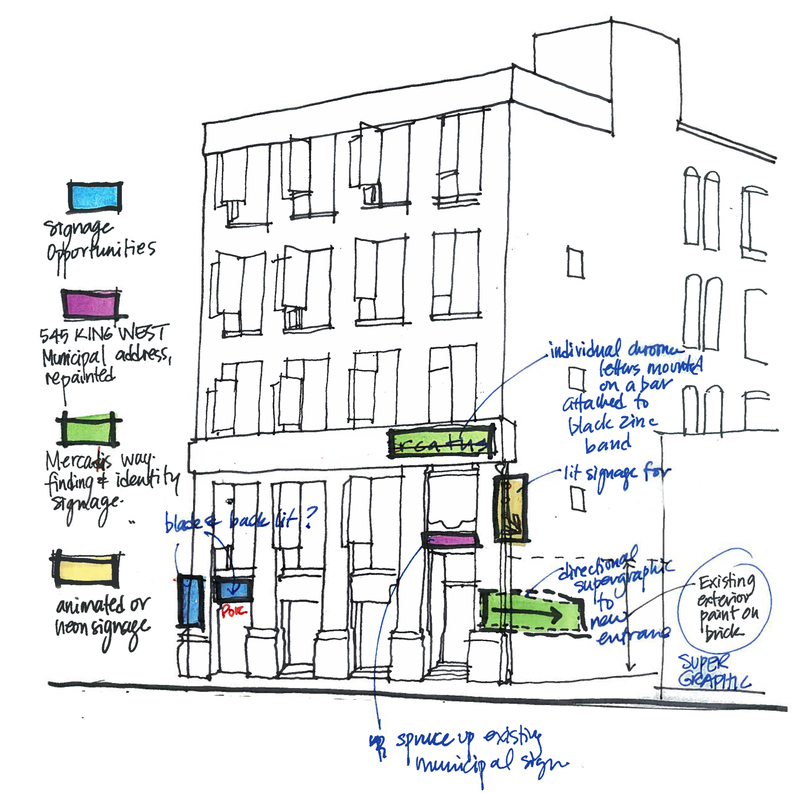 The simple but dynamic concepts applied to the façades and laneway provide better visual connection into the building and extend the street life. 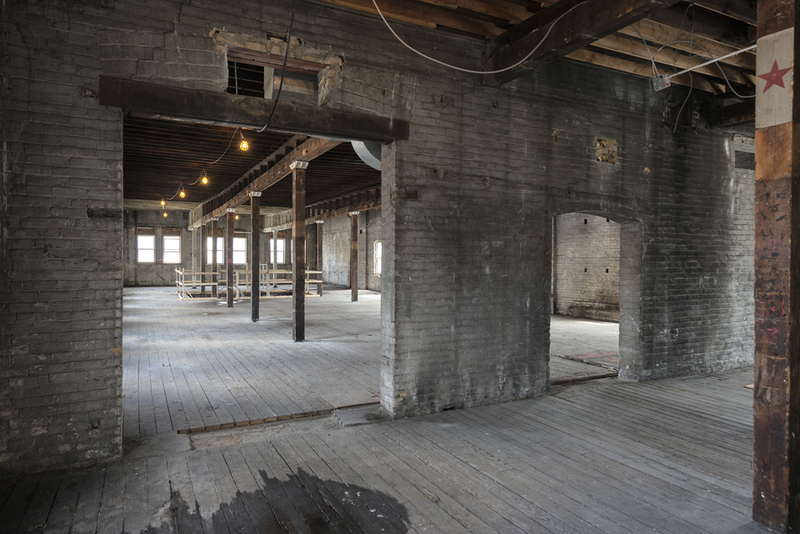 The difficulties associated with adaptive reuse can be a deterrent to many developers. Unforeseen discoveries on site – from mould to hidden fuel tanks – can have negative impacts on cost and schedule and the added complexities often require creative solutions. Despite the challenges, the benefits are multi-fold. Rehabilitated and repurposed buildings not only help meet city-mandated density requirements, but they contribute to the fabric of city life and the continuity of collective memory. With a long-time specialty in retrofit and adaptive reuse, Quadrangle brings agility and nimbleness when working with existing conditions. A synergy clearly exists between the developer and the architects – this is, after all, the third collaboration of similar objective between them. “Hullmark understands that buildings like this have value and that value is worth working hard to unlock”, says Witt. Under the direction of Jeff Hull, Hullmark’s vision as city builders, previously known for their large residential developments, has taken a more urban focus and set its sights on high quality inner-city tenants. 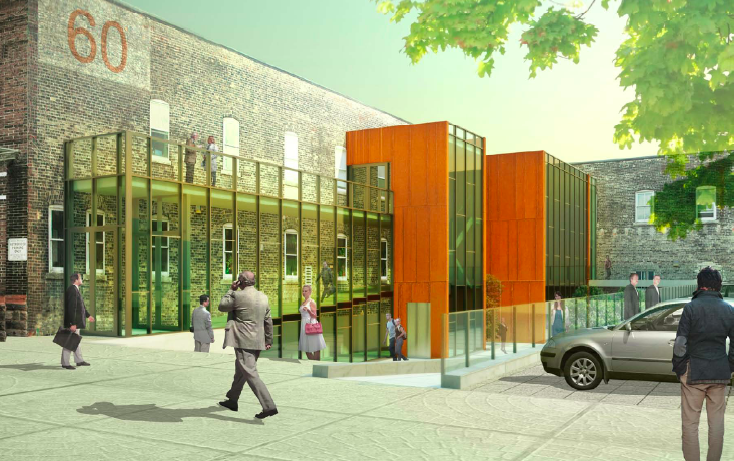 By renovating and turning a former warehouse into a vibrant employment and amenity hub, the building both reflects its history and becomes relevant to the future of King W.
Other than the alleyway installation, the 545 King Street West project is scheduled for completion this summer. A version of this post appeared in the June edition of Canadian Facilities Management & Design. Park Property Management renovation by Quadrangle Architects. Photo by Bob Gundu. When rental company Park Property Management (PPM) required an additional office, it searched its apartment inventory. It unearthed 2,000 square feet perched atop a north Toronto building, 15 storeys up. Long forgotten, the penthouse had been relegated to a storage depot, stashed with cleaning supplies, gym equipment and the superintendent’s found treasures. PPM called on Quadrangle Architects’ Interiors Group to see if there was any hope for its rehabilitation and conversion to a workplace. Herman Miller Workstations. Photo by Bob Gundu. Having outgrown its current digs, PPM needed to manage some 12 buildings from this location. The program was simple: two private offices, workstations for a small number of staff, file storage, a meeting area, a kitchen, and a space to greet visitors. PPM also wanted the flexibility to grow. Completed in November 2013, the project didn’t involve a great deal of building; the space was mostly in desperate need of a clearing out and freshening up. Original inherited features including the terrazzo floor and radiators were retained, and the exposed concrete folded plate ceiling was stripped of random adhesive tiles and clad in drywall. Small storerooms were demolished and an updated HVAC system was installed. The biggest ticket item was the perimeter’s total window replacement, which in turn had a positive effect on light quality and energy efficiency. The design direction for the interiors was borne of the building’s early 60s vintage and the space’s strong architectural language: align the interior design with the architecture by emphasizing its mid-century modern heritage. Walnut veneer is used in the millwork, extending to the furniture and accessory pieces, while accent details are co-ordinated in black or satin bronze finish, right down to the tiny tapered cabinet pulls. 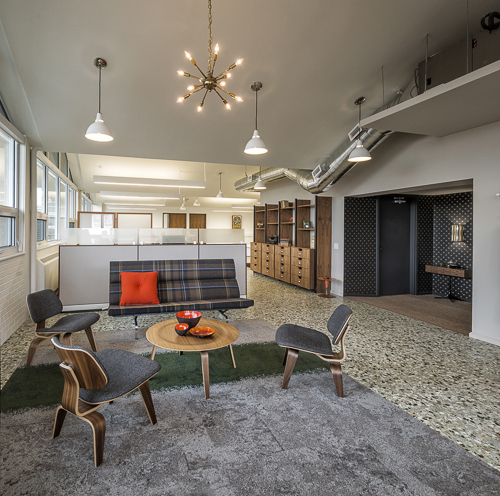 The new Mad Men-inspired office blends commercial and residential; PPM, after all, is in the business of where people live. Just as building superintendents and managers come to the office to discuss operations, tenants come to sign leases or negotiate sublets. “We wanted to give it a warm, residential feel, but without seeming false, folksy or artificial,” Robbie said. Entry vestibule at Park Property Management. Photo by Bob Gundu. 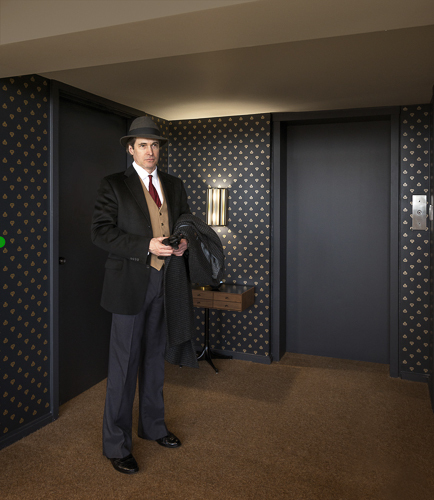 Visitors step off the elevator into an intimate vestibule, only seven feet in height. A wiry carpet recalls an entrance mat and the painted black walls are adorned with an overlay of repeating company logos in gold leaf, simulating custom wallpaper. Period-correct wall sconces complement the residential aesthetic. From there, the low ceiling gives way to reveal a light-filled and lofty open plan space peaking at 12 feet. Simple white lighting fixtures hang overhead. Underfoot, carpet tiles are grouped to resemble area rugs, picking up green, grey and brown tones of the terrazzo flooring. The waiting area, more akin to a living room, is distinguished by a carefully curated collection of signature Eames pieces: lounge chair, coffee table and compact sofa. This classic design furniture by Herman Miller is mixed with a row of crisp white contemporary workstation systems tucked under the profiled ceiling, channeling a retro feel. “It resonates with a certain generation of people but it still looks modern. To me, modernism still looks fresh — it doesn’t look dated,” Robbie said. Meeting area at Park Property Management. Photo by Bob Gundu. Two private corner offices follow. The remaining open area has a meeting space with bright orange Eames shell chairs and banks of files. The area can easily be added to or reconfigured. A kitchen and powder room complete PPM’s new office. File storage was a priority. Going paperless is a growing trend, with many workplaces now managing information electronically. But the rental industry, with its paper-based origins, is in a transitional phase. Leases are still penned and copies must remain on site as long as leases are active, amounting to loads of paper records. With that in mind, designers stacked some filing cabinets three high and turned them into work surfaces. They also arranged some filing cabinets singly, so the cabinets can double as upholstered benches. Kept low, they don’t create a wall, visually or practically. “We tried to do it in a way that the stuff didn’t get in the way of the people,” Robbie said. Tiny kitchen with tall walnut veneer cabinetry, intermingled glossy and matte tile backsplash, and a brass faucet. Photo by Bob Gundu. And where they could refurbish, they did, often with a sense of whimsy. A 60s Sputnik chandelier was re-appropriated from another property, and a glitzy pinball machine reinvented by one of the company’s owners was placed upright as artwork. 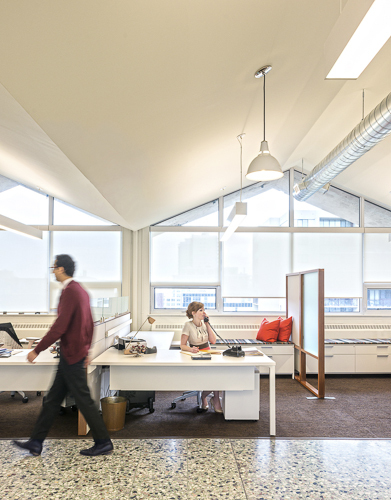 The renewed interior not only makes more efficient use of the real estate, but it offers a highly functional and comfortable workplace where one had not been envisioned. Stephanie Calvet is a Toronto-based registered architect and a writer specializing in architecture and design. She has 11 years’ experience working in architecture and planning firms in Boston, designing projects in the hospitality, multi-unit residential, education and healthcare sectors. From a historical perspective, there is nothing groundbreaking about the live-work model. People have been living and working under one roof for centuries; think shopkeepers with their dwellings upstairs. Artists have built on that paradigm, transforming warehouses to accommodate the amenities of a home as well as open studio space to create and store finished artwork securely. While commercial loft space – retrofitted with the necessary utilities – has always been a hot commodity amongst the creative community, the advent of live-work space has made the concept of living close to one’s work even more appealing, and – as developers realize – marketable. This trend seems to fit well with our changing economy. With the recession many have shifted to self-employment, but more than that, the norms have changed. The stable, sequential career paths of a few decades ago are far less common, and a growing number of people work from home, facilitated by technology and online connectivity. Although many live-work spaces are marketed specifically towards retaining local, professional artists, the set-up gives greater opportunity to entrepreneurial residents. It describes a new take on an old idea. Example of a 2-storey Live-Work unit at DUKE Condos. Rendering courtesy of TAS. 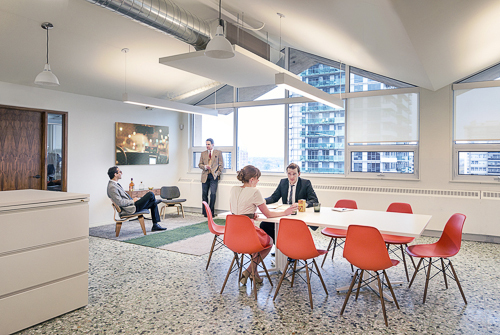 There are a number of facilities designed and built especially with a live-work purpose in Toronto’s building stock. 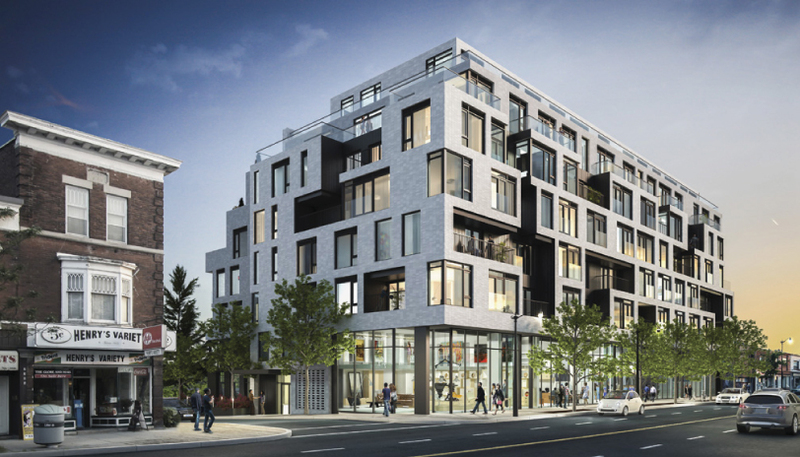 One of the newest is DUKE, a mid-rise residential development by Quadrangle Architects for TAS in the retro Junction neighbourhood. The seven-storey structure will add 109 condos to the area, including five live-work units aimed at creative entrepreneurs. Street view of live-work units at DUKE Condos. Rendering courtesy of TAS. Southeast corner of DUKE Condo, designed by Quadrangle Architects for TAS. 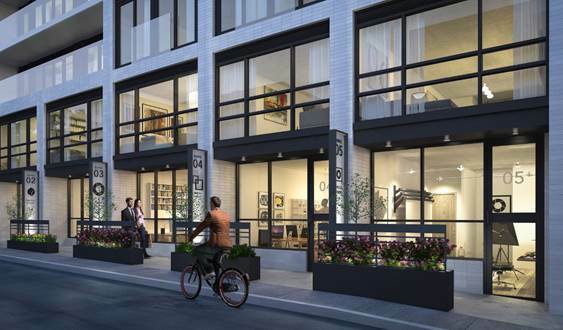 While the building will turn its most animated face to Dundas Street West, featuring a mix of high-ceilinged retail shops at grade, located along the quiet laneway to the rear of the building, with south facing frontage, will be the 2-storey live-work units. These suites are well suited to artists, designers, small business and anyone who needs a distinctive work address, with living quarters above. With direct access from the street, their lower level is designed such that the front can serve as a showroom or work area with a back section that has storage and a washroom. 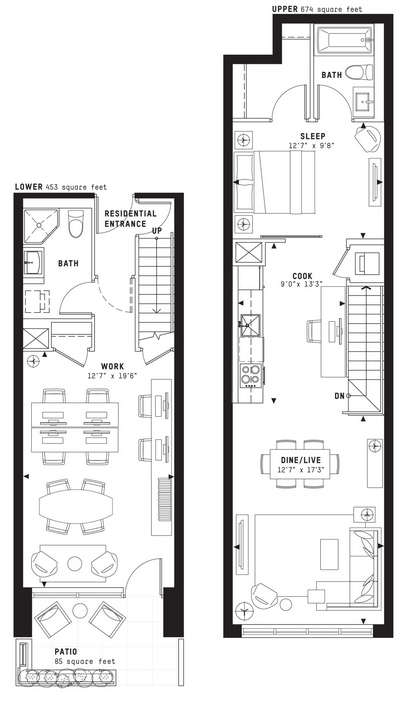 Floor plans of a Live-Work unit at DUKE Condos. Image courtesy of TAS. It is a reinvention of creative urban living where owners can conduct business during the day and return to their private quarters off-hours. 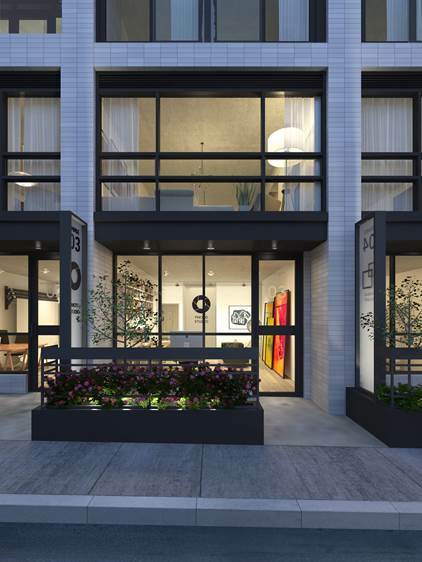 The units are decently sized, averaging 1150sf with one model at 1548sf. Each has a small patio at the front to provide a bit of privacy from the sidewalk. Frontage of a typical Live-Work unit at Duke Condos. Image courtesy of TAS. Also on offer are 2-storey townhomes nestled among the houses along Indian Grove – a more conventional living space for urban families. Stephanie Calvet sat down with Michelle Xuereb, architect and sustainability strategist at Quadrangle Architects, to discuss the green aspects of DUKE Condo’s design. 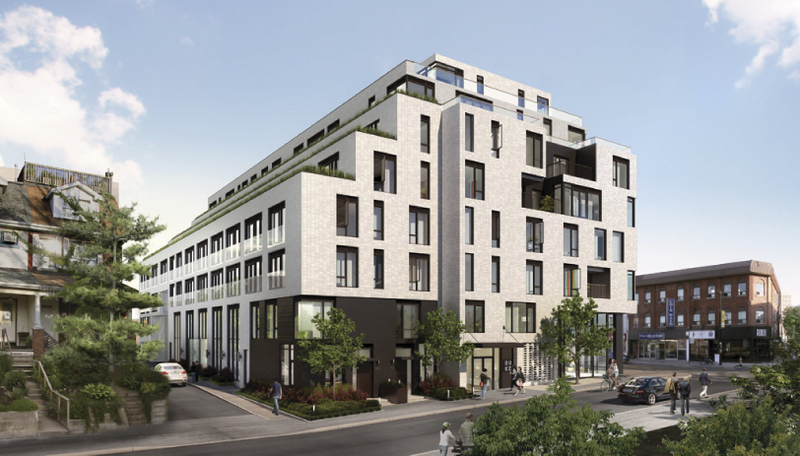 The mid-rise building, which takes its name from an amalgam of Dundas and Keele streets in The Junction, is under development by TAS. 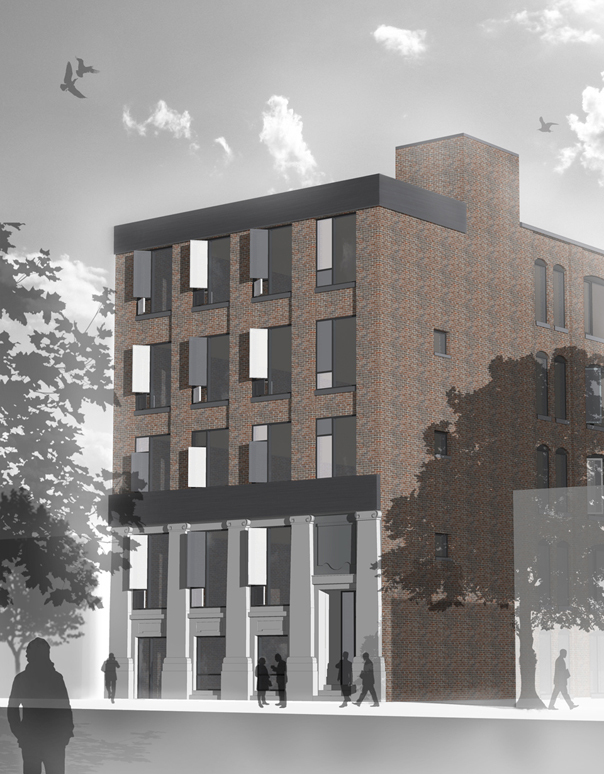 The latest rendering of what DUKE will look like, as designed by Quadrangle Architects, image courtesy of TAS. 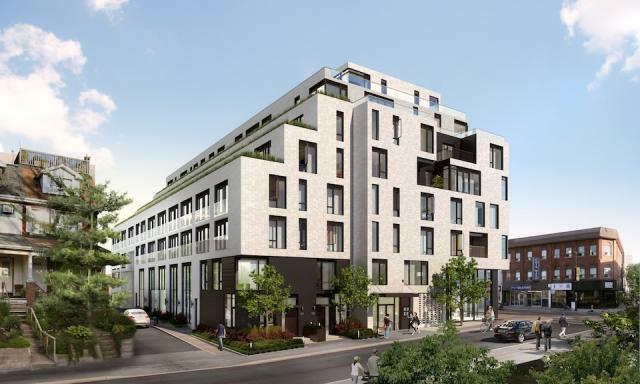 TAS has been trumpeting the lengths they are going to, to create a sustainable condominium building in Toronto’s Junction neighbourhood since launching DUKE Condos last year. It is encouraging to see a developer raise the bar beyond what the building requirements call for. For TAS, it is about building community, about being a good neighbour, and understanding there is a social, economic, cultural and ecological side to everything. TAS is motivated to build their business philosophy, outlined in their ‘Four Pillars of Sustainability’, into all of their projects. Was the decision at DUKE to ‘go green’ to the degree that it is in anticipation of new energy efficiency regulations in the building code? For this site, they have to comply with City of Toronto Tier 1 and the Green Roof Bylaw. Anything above that is their own initiative. 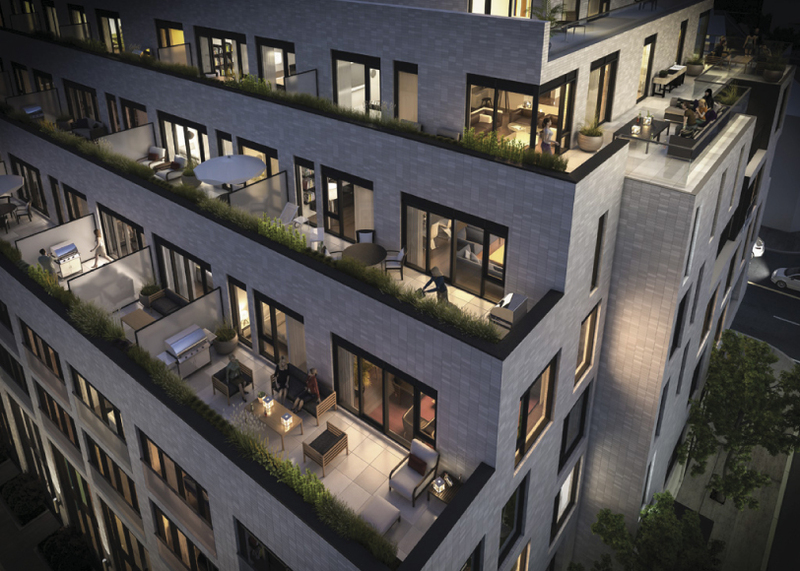 High window-to-wall ratios are a current condominium design practice in Toronto, a feature that seems market-driven, not rooted in energy performance. How do we reconcile that with the fact that significant energy savings are available in building envelopes with less glazing? I think it is actually more developer driven, and also driven by economics. Putting up a window wall system is straightforward and quick – it makes everything happen faster. Sales took off on this building and it is not floor-to-ceiling glass. I believe you have to put something out there so people realize they want it. DUKE has a specific character and people are attracted to that – and the scale is right, the materiality feels good, and it is just standard materials: windows, brick, and some metal siding. It is quite simple but it is a different approach than just cladding in glass. Which aspect of the building’s design do you think has the biggest impact in terms of sustainability? Through which methods did you assess net energy savings? The envelope is key. It’s about getting window-to-wall ratio down— 40-50% is where you want to be—using the best glazing possible, and reducing thermal bridging as much as possible. The window will always be the weakest link in the building so the more you can shrink that aperture, the less heat you’re losing. At DUKE we’re using aluminum frames and the glazing is argon filled with a low-e coating. At Quadrangle, we design what we think is the right thing to do and we have to be asked to do less. We feel we have to lead that way. The bonus from the recent Toronto Green Standard changes is that it makes it a level playing field for all developers – everyone has to do this. We do energy modelling early in the process. There’s great citywide interest in local and organic food. DUKE’s south side terraces are being lined with built-in planters that can be used for home gardening. Are you ‘leading the way’ by incorporating this feature into the design or is it in response to social shifts and increased demand for urban agriculture in residential developments? There are various non-profit organizations out there advocating food policy in buildings, trying to push legislation, trying to speak to developers about how to make food happen. We too are working with these companies to help promote and push these initiatives – for one, we put food production ideas in our renderings. There’s no reason your front garden can’t have edible food. And TAS has been doing it from their side as well. We are all hoping that it really takes off. And the planters came out of another reason as well: affording neighbours to the south some privacy by having the depth of this green buffer, rather than just a railing. When there are multiple reasons why an element makes sense, it’s likely to stay ingrained in the building, and not get value engineered out. Standard suites include engineered hardwood flooring, water-conserving fixtures, energy efficient appliances, programmable thermostats, and Energy Recovery Ventilators (ERV) to reduce energy demands and enhance air quality. Have these innovations come down in price so that the developer can provide them as part of the standard offerings? There are a lot of things that have become more standard, like low-VOC flooring or paint, and it has become a requirement to provide energy metering to each suite. ERVs haven’t really come down in cost – the additional ductwork costs everybody more – but TAS has elected to do this anyway because it’s about improving indoor air quality and it’s something they can market. A total of 25% of the parking stalls will be equipped with an electrical outlet for plug-in and provisions were made for future energizing of the other spaces. Will you provide a central bank of dedicated charging stations? What does that mean for the electrical capacity of the building for each space to have the possibility of EV chargers? Why go this route instead of the (less costly) car-share option? This is a goal of TAS’ to do this. At one point we had a car share vehicle space within the building but there’s enough within the neighbourhood. The way things are going in the future, it will become more and more economical to have a plug-in electric vehicle. People in North America are pretty attached to their individual car ownership. To provide infrastructure for people to have plug-in electric is about future-proofing the building. But as for how it’s specifically going to work at DUKE, whether they will run it to a panel that is individually metered, we haven’t finalized it yet. As per the city’s Green Roof Bylaw, certain % coverage of the roof is required to be a green roof, based on the building’s gross floor area. Which system will you provide at DUKE? It will be a drought-resistant, low-profile, extensive green roof (vs intensive – where you can plant trees and shrubs). Probably a tray system. Green roofs raise your top of roof that much higher, so you have to be careful of how you distribute the heights because you lose potential area if the roof is too thick, plus you have to consider structure. There is always a trade-off. The benefits of a green roof are multifold. Do you believe that in the near future, sky-gardens will become both desirable and inevitable as part of a growing cityscape? I wish it would become more prevalent because we see it as a positive attribute. Right now, green roofs cost more money and the market isn’t necessarily looking for it, so we’re not there yet. And the Bylaw % requirements aren’t high enough in terms of how much you are obligated to provide for anything more than something quite basic, i.e. a low-profile extensive roof. If the developer wants to build a lot more, it’s just additional expense and if they can’t use it as a marketing tool, chances are they won’t opt to go that route. How do you think we can best encourage that sustainable strategies be followed on all building projects, from conception through construction to furnishing? There have to be financial incentives and legislation, otherwise it won’t happen, as well as the fact the City of Toronto itself has taken a leadership position on this: 15% better than the current building code. That level is really the 2017 version of the code. It’s those sorts of energy initiatives – being a certain percentage better than code – that have been happening at the municipal and the provincial level, which have been pushing the envelope. There is always cost involved with change, i.e. change from traditional to sustainable construction practices. Consumer awareness about conservation and low impact development issues is key and people might be interested in ‘doing the right thing’, but when the rubber meets the road, they aren’t always willing to pay more. What could be the facilitating mechanism that will encourage consumers to make the extra effort for eco-friendly avenues knowing that payback will come later? I’d say it’s the consumer, the purchaser. At the end of the day, it’s the cost per square foot, and they want to know they are getting a certain kind of countertop. Right now, what I’m hearing from marketing folk is that people don’t want to pay for ‘green’ initiatives, they think that the buildings should come with them. The green is just part of the story that people are expecting to see as opposed to it being an add-on, and having to pay more for it. To me what would be interesting would be a developer who would work really hard to bring those numbers (maintenance fees) down and the way to do that would be to provide an extremely durable building. 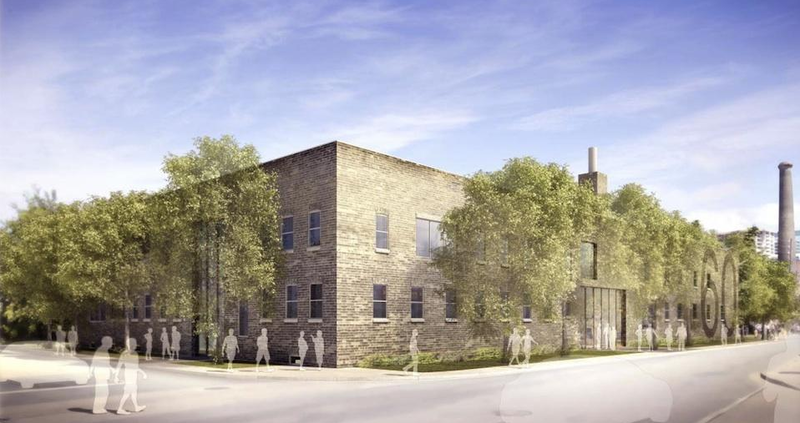 The adaptive reuse of 60 Atlantic Avenue by developer Hullmark will create 27,500sf of office space and 12,500sf of retail and restaurant space in a former factory in the heart of Toronto’s Liberty Village. 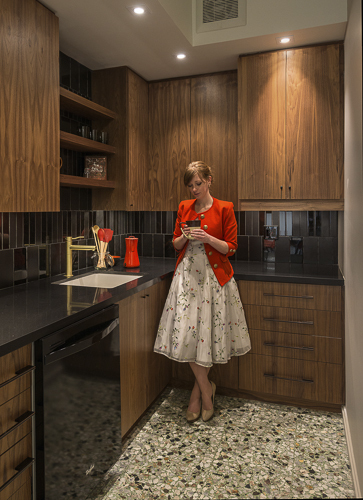 In this 2nd part of a 2-part article, UrbanToronto’s Stephanie Calvet sat down with designer Caroline Robbie of Quadrangle Architects to discuss the interiors fit-out. Anchor tenant INVIVO Communications, an innovative company working at the intersection of science, biology and technology, will move into the top floor early next spring. Both the neighbourhood and this building itself have a history as a creative community. Are you collaborating with local artists and artisans in this project and if so, how? We try to bring an element of custom art into every project we do, whether it is internally generated through custom graphics or through collaborations with artists and industrial designers. The building’s history is being celebrated through a custom version of a Goads Fire Atlas illustration that will be used to film a glazed corridor. The original image was enhanced by our design team to highlight the building. 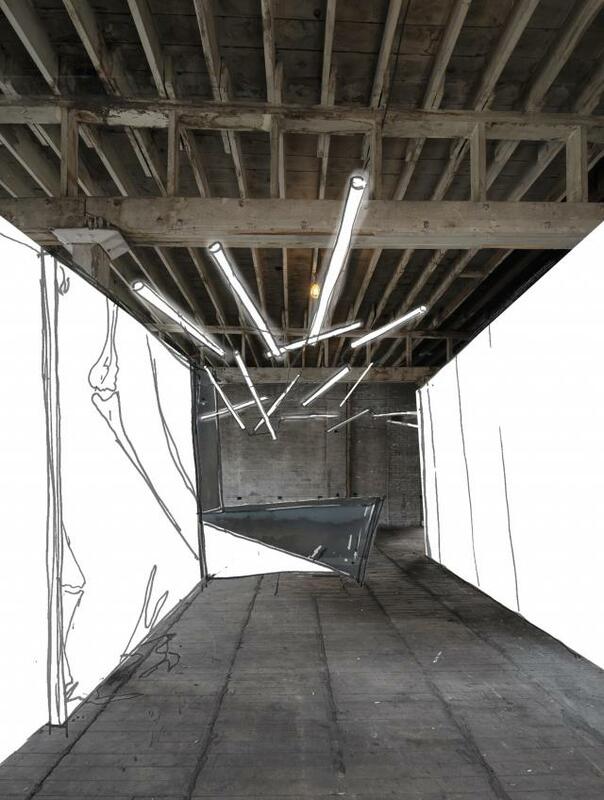 While it is still in the design stage, artist Zac Ridgely is developing a custom feature light fixture for the INVIVO space. I understand that Quadrangle uses part of its office space as a ‘testing lab’ for design services that it offers, such as investigations in graphics for frit patterns on glass. Have you done similar explorations that have benefitted this project? We ‘mock-up’ new ways of manipulating images and materials in our studio on a regular basis. This helps not only determine construction methods but it lets us live with something for awhile and gain insights and opinions from the larger studio group. The Goads Fire Atlas film developed for the corridor has been mocked up for some time in a prominent circulation space in the studio. In a previous interview you said, “buildings need to learn, grow, and change over their lifetime – it’s about adaptability and flexibility.” Does this building have good bones? Is it an example of what you call “durable architecture”? The one constant in life is change so something as permanent as a building needs to be inherently adaptable. This building and Liberty Village are great examples of the reuse potential of Toronto’s industrial past. 60 Atlantic’s durability lies in its building quality as well as an ability to accommodate changing needs over its lifetime. The beauty of the interior space once extraneous elements were removed was remarkable. We have tried to touch it gently so that the bones are visible. The following questions are specific to the interiors fit-out for INVIVO Communications, an interactive agency that provides innovative digital solutions – games and apps – to the global pharmaceutical and medical device industries. 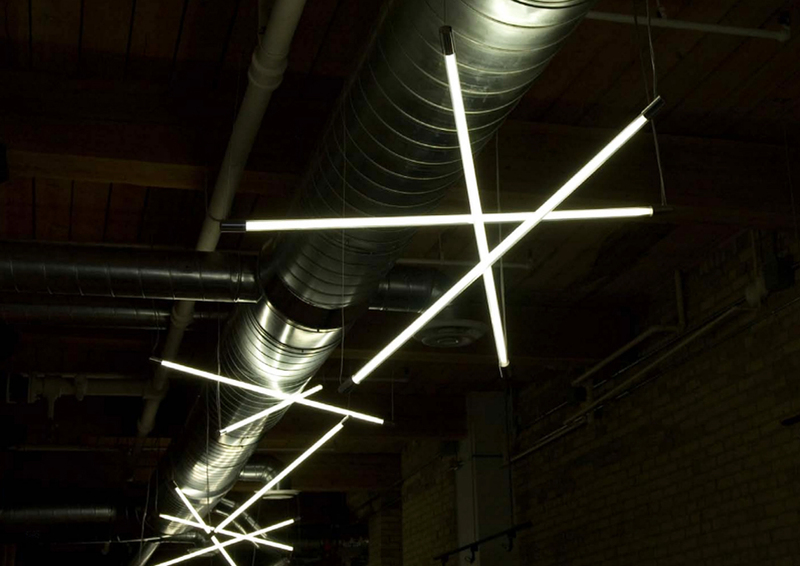 The entire office’s lighting design strategy with, for instance, splayed linear tube lighting, is intriguing. What is the guiding concept behind it and what sort of imagery have you incorporated into the workspaces? INVIVO has healthcare at the core of its purpose, but their culture is about innovation, animation and app development. The environment is definitely not clinical and we needed to respect their playful nature while providing an effective workplace that spoke to the nature of their business. The central design organizing principle is about white matter, the lesser known component of the central nervous system that consists of glial cells and myelinated axons that transmit signals from one region of the cerebrum to another and to other brain centres. White matter is a fine meshwork-like structure that we have referenced in the free-form lighting throughout the main circulation spine of the space. 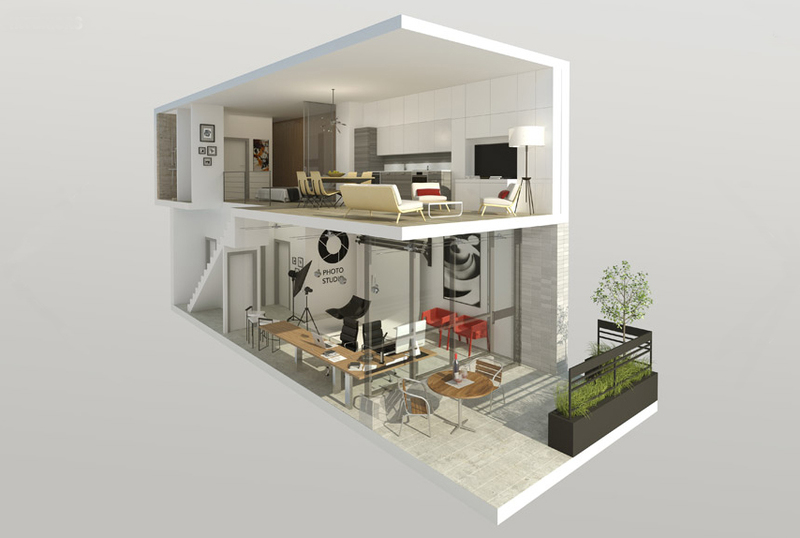 As you juxtapose the old with new, the basic with the high-tech, what are the qualities that the interiors will evoke? We hope that the most characteristic quality is of comfort. The mix of materiality and technology, linked through the energetic culture of INVIVO, will allow the space to embody the modern workplace. Working in a sector where technology is constantly changing, a company like this one likes to stay on the cutting edge. How will that be reflected in the interiors? Which trends play a part in the design? We tend not to follow trends but instead make sure we are paying attention to the influences on the businesses of our clients. Technology is such a key component of the business – it has played a big role in the planning. The IT department has been pulled out of a backroom and into the fulcrum of the studio. In our experience, technologies move too fast for us to think we can design to anticipate what will be needed so we defend open, unprogrammed space as it will allow the flexibility that will inevitably be needed. Toronto is the North American base for medical illustration and INVIVO is one of the fastest-growing companies in the field. Just as there is a need for flexibility to update the ‘feel’ of the brand as it evolves, what sort of flexibility is there in the design of the physical space? Are there provisions for expansion? There is growth potential on the floor within open office clusters and the overall space planning has incorporated enough balance between spaces for focus and spaces for collaboration that project flow is not inhibited by the design of the space. Are there any specific technical (communication, wiring etc.) requirements that are appropriate for a company at the forefront that is constantly revolutionizing user experiences and that has a futuristic component? There are no extraordinary technical components in the design other than to provide a very flexible power and data delivery system throughout the space. Blue and green were integral colours to INVIVO since its beginnings and have always been part of the branding. Did you utilize the colours in the interior design of the office and if so, where? No, we haven’t incorporated the branding colours as we are leaving the design of the space intentionally white as a background palette for the artwork that is created by the artists and developers at INVIVO. Corporate giants like Google, with their unconventional workplaces, have embraced the idea that creative work environments help stimulate minds and inspire innovation. If you subscribe to the notion of a studio culture that allows the space to offer all varieties of collaboration, how do you go about making it happen? Rather than try to force behaviours, it is better to allow people to hack space. We worked to ensure that the space has good light, great views, is comfortable and has the resources they need like wifi and power, in the right places. Once those elements are in place, companies dependent on innovation provide the right tools, which in turn allow their people to foster creative thought. For efficiency, the base building design team (architectural, engineering and construction) is coordinating M&E systems with INVIVO directly for their use. How have you proceeded with the rest of the spaces considering the additional tenants have yet to be determined? We have tried to ensure that base building systems like vertical shafts and electrical feeds are in unobtrusive positions while still providing coverage for flexible multi-tenant floor layouts.